Shops crowd busy and often have cash settlement to avoid trick to losses, in addition, to install CCTV as a deterrent and also real-time monitoring and record evidence when disturbed can grasp. 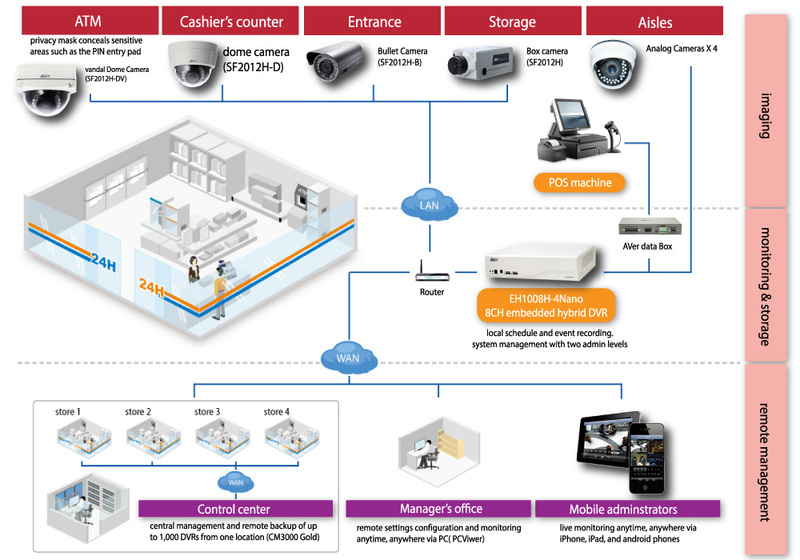 Here is the example of 24 hours convenience store as an example, overview how the headquarters remote monitor the security and operation of shops in different locations. - Decide the location that need to install CCTV / burglar alarm. In this example is ATM, cashier's counter, entrance, storage and aisles. - Each location has CCTV monitoring and storage of images by their own computer networking. - Authorized persons such as control centers and department head, the device can view images through the different shops of instant case. Any questions? Don't worry! AME is already for you at anytime and tailor the most appropriate solution to you. Please contact us immediately! AME Security Limited founded in 2010, our company since its inception, the service team with professional knowledge and new technologies provide more reliable and stable services to customers. Just a few years, AME has been exceeded more than 1,000 customers to provide our professional services. Copyright 2013 by AME Security Limited. All Rights Reserved.